Earlier this year, MLB announced plans to reprise the RBI Baseball name as part of a newly developed video game that would be available across a variety of gaming platforms. And really, who can blame them for trying to piggyback on proven success? 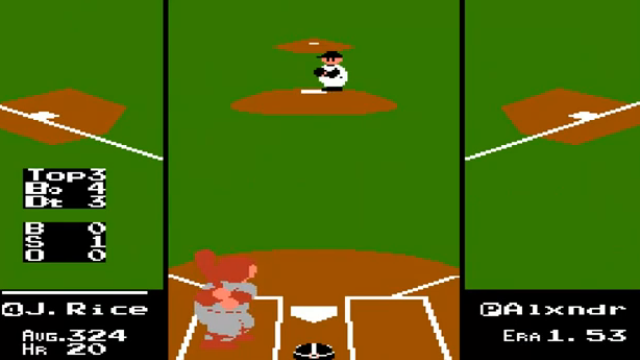 The original RBI Baseball, developed in the mid-1980s for the 8-bit Nintendo Entertainment System, is one of the best baseball video games ever created. 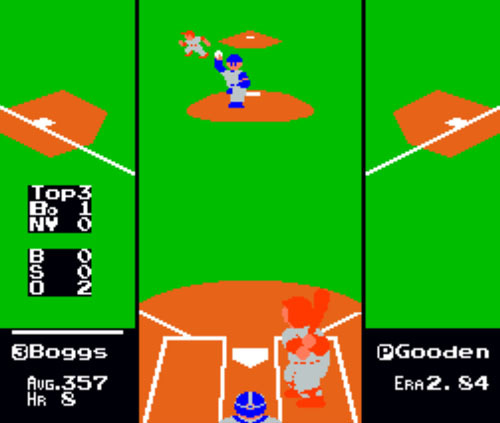 Developed by Namco and published by Tengen, the game was licensed by the MLB Players Association, but not by Major League Baseball itself. There are only eight teams in the game (and also two All-Star squads). Teams are referred by city only and player names are not used anywhere within the original game. Presumably this will change now that Major League Baseball has its hands on the development process. As we noted in the 2010 iteration of this post, playing the original RBI Baseball is especially satisfying for Red Sox fans because the “Boston” roster is absolutely stacked with both players who were good in real life and in the video game as well. Exactly why the game’s creators decided to make the Boston team disproportionately awesome remains unexplained. Playing off of the Baseball Prospectus “most comparable players” feature that is used to develop the PECOTA projection system, Fenway Pastoral presents a preview of the 2014 Boston Red Sox real-life roster, as summarized by the “Boston” team RBI Baseball comparables. Statistics following players are the totals as listed by RBI Baseball. Namco mainly used individual players’ numbers from the 1986 season in configuring gameplay skill levels. Exceptions included Tony Armas and Ellis Burks, as further explained below. Barrett is a top-of-the-order guy who can routinely assault all fields with line drives and also knock out the occasional home run if an opponent grooves a pitch over the plate. He may not be the best leadoff hitter, but if a player is patient, RBI Barrett is almost never a cheap out. The accomplished veteran who was a productive player in the National League prior to coming over to the AL for the back nine of his career. The similarities between Victorino and Buckner probably end right about there, but we have to saddle somebody with this comp and Shane is probably going to see the majority of his at-bats at either leadoff or the No. 2 hole, so what the hell. The middle-of-the-order high-average, low homer guy. RBI Wade Boggs only hits dingers on mistake pitches or if the opponent leaves his pitcher in the game for too long. But much like the video-game Boggs, you can count on a bunch of doubles out of Pedroia even if the homers may be more of a rarity these days. Rice never seems to hit as many homers as you think he should. But that doesn’t stop you as a RBI gamer from swinging for the fences when he’s at the plate. If he makes contact and it doesn’t go over the fence, it’s usually a hard single to left field or a harmless pop-up. As the No. 5 hitter, Baylor’s 30-plus home run power makes him a guy you can’t take for granted in the lineup when playing RBI Baseball. Players who make mistakes over the middle of the plate are routinely embarrassed by tape-measure home runs. But Baylor hit for a low average due to 111 strikeouts in 1986 and he was clearly on the tail end of a productive career. The game’s creators at Namco largely chose to ignore all this when inputting his skill set for game-play. In a similar sense, Napoli’s propensity to strike out can be overlooked since he probably represents the team’s best shot at 30 home runs from a right-handed hitter. Namco blessed Evans with power that can translate to all fields and very few of his home runs are cheap. For the 2014 team, we’ll give the honors to Will Middlebrooks. Sure, it may seem like a stretch but it’s not necessarily out of the question WMB runs into 26 home runs during the 2014 season. Gedman gets overlooked due to the firepower in front of him. But he’ll get his knocks here and there if he gets the chance. Almost every RBI gamer will immediately substitute Owen out of the lineup for one of Boston’s more intriguing bats that wait on the bench. Who can resist when all fielder attributes are static regardless of who is substituted into the game? It doesn’t exactly work that way in real life, but Boston has more or less treated Drew this winter the same way Owen is treated by RBI gamers. Henderson is a sentimental favorite for those old enough to remember his two gigantic Game 6 home runs during the 1986 ALCS and World Series. He’s a good pinch-hit option in RBI play as well if the match-up is right and the player is looking to change things up. He provides some pretty solid pop off the bench and only further adds to the embarrassingly rich depth of the Boston roster. Sizemore has some comparable sentimentality going for him if people are willing to remember far enough back. Sizemore hit 10 HR for Cleveland in 2011 so it’s not too much of a stretch to think he could hit 15 for the Red Sox in 2014 if things break a certain way. Burks’ listed stats are actually from the 1987 season. But he was a well-known prospect after being selected by Boston with the 20th pick in the 1983 draft. The Bogaerts hype will likely reach its critical mass by the time the season starts in April. Even if he underperforms early on, he belongs on the major league team. Forgive fans for looking ahead to what’s in store. No offense of course to Stephen Drew. But just to draw out this analogy, the makers of RBI could have either put a guy like Steve Lyons (1 HR in 275 PA in 1986) on the bench or fudged the truth a bit and, as they did, stuck 1987 Ellis Burks in the game. Who can blame them for choosing to include the exciting rookie over the veteran? Armas’ statistics on the RBI team are from the 1984 season rather than the 1986 season. Instead of listing him with 11-home-run power (his actual total from ’86), he is blessed with the ridiculous power he exhibited in 1984, when he banged out 43 home runs. Even as he approaches 40 years old, Ortiz remains remarkably consistent in his power numbers. He continues to make solid contact on just about everything left out over the plate, year in and year out. Just as nobody knows for sure why the RBI makers decided to immortalize Armas’ 43-home run season from two years prior to the game’s official production, no one can quite explain why Ortiz seems to be able to keep turning back the clock year after year after year. Armas doesn’t have a position in the field, but a savvy RBI gamer finds a way to get the biggest power bat on the team into the lineup at all costs. A necessary evil. A placeholder. A last-resort option, hopefully. He fills out the roster and you hope, somehow, someway, he isn’t really needed after a while. The right-hander from Texas who shows ace potential but who ultimately seems to fizzle out a bit earlier than you’d like. If you begin the game with Clemens, you may very well run through the opposing order with ease the first time through only to see a couple of hitters take his fastball out of the park the next time through. Buchholz’s starts – and his career of late – seem to be mired in a similar state of greatness restrained. Lester is the no-brainer for this comp, especially after his high-level performance during the 2013 postseason. (Hurst would have had a case for the World Series MVP in 1986 if things had gone differently.) Hurst almost always gives RBI gamers five innings (the equivalent of six or seven in a real game) and he misses plenty of bats along with way if players deftly utilize the screwball feature by holding the up button as the pitch is delivered, resulting in a killer amount of movement on offspeed pitches. More revisionist history from the RBI developers here: Stanley never had an ERA below 2.60, which he posted in 1978 pitching 141 innings primarily out of the bullpen in the process of finishing 7th(!) in Cy Young balloting. Stanley was pretty good a few years before the game came out. But with a fastball that tops out at 82 MPH, RBI Stanley’s stuff isn’t going to fool too many people on most days. We’ll give the dubious honors here to Capuano, as the veteran comes to town hoping to give the team back some of the innings it is losing with the news that Ryan Dempster is retiring. It will work out some of the time, but with the lifetime National Leaguer heading to the AL for the first time, he is going to take some lumps.